The human column of over 12,000 people, some 3,000 families, is an impressive sight as it sets off on its march during a cold night at the beginning of winter in Paraná. The peasant army advances in almost total silence. All that can be heard is the panting of lungs accustomed to great effort and the muffled sound of feet on asphalt. Judging by the direction in which the human wave is heading, it is not difficult to guess that its final direction is the Giacometi plantation, one of those gigantic latifundios so typical of Brazil. Despite these latifundios being marginally productive, their colossal dimensions nevertheless guarantee their owners a millionaire’s income. Correctly utilized, the 205,900 acres of the Giacometi plantation could provide a life with dignity for the 12,000 souls marching at this moment in its direction. A peasant walks quickly: 13.5 miles have been covered in less than five hours. When they arrive, day has begun to break. The early hours of morning are shrouded in heavy fog. Little by little, affected by the humidity of the Iguaçu River, which flows quite close by, it clears away from the ground. With no reaction from the latifundio’s small army, the men in the vanguard break the padlock and the gate opens wide. They enter. Behind them, the human river begins to move. 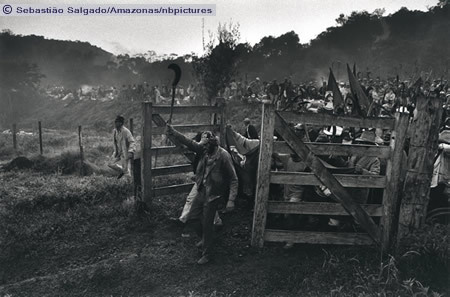 Scythes, hoes and banners are raised in the unrestrained avalanche of hope in this re-encounter with life - and the repressed shout of the landless sounds as one voice in the brightness of the new day: ‘AGRARIAN REFORM - THE STRUGGLE OF ALL!’ Paraná, 1996.